Pāli is the language of a large body of ancient Indian texts, known as the Pāli Canon. Followers of one Buddhist tradition, the Theravāda, equate these texts with “the word of the Buddha”. They accept information given in one of these texts that the Buddha, a man called Gotama, died at the age of 80 (or thereabouts); most of them hold that he died in about 483 BC, but those who care about such matters mostly accept modern scholarship when it says that he died in about 400 BC. They also accept information from the same source that the Canon was established at a Council of Buddhist monks soon after the Buddha’s death, and has been successfully transmitted by monks and nuns ever since. They assume that Pāli must therefore be the language in which the Buddha preached. The texts, they believe, were composed orally and for the first few centuries preserved orally. Other Buddhist traditions take different views. For various reasons they propose a very diverse range of dates for the lifetime of the Buddha. They also note that several other versions of the same texts, composed in different Indian languages, are known to have existed; some are lost, but several fairly full versions have survived in Chinese translations. These other traditions mostly propose that the First Council took place much as described by the Pāli tradition, but the texts then established were the versions proposed in their own traditions. Though the Chinese translations are mostly dated (within the Christian era), we have no solid clues to the dates of the composition of their Indian originals. On the basis that they consider the dating of the Buddha to have no credible basis, in recent years many scholars, particularly in America, have held the view that there may never have been such an individual as Gotama Buddha. They claim that even if there was, we know virtually nothing about him. Prof Gombrich begins the final chapter of his book What the Buddha Thought by citing a professor at Chicago University who says that Pāli sources are “centered around the literary conceit of Gotama ‘preaching’”. He sneers at Prof Gombrich’s believing this conceit, but offers no view of how, when, where, by whom or in what language this huge body of texts was composed. The scepticism of these scholars concerning the Buddha’s date extends to the dating of all the canonical texts, first and foremost their Pāli versions. However, they seem to have no proposal how we should imagine that the Pāli texts (or any others) were composed or preserved. Or: Did the Buddha speak Pāli? 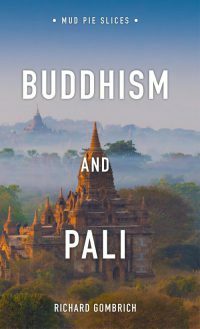 Prof Richard Gombrich has written a short book called Buddhism and Pāli, which has been published by Tony Morris in his series Mudpie Books. In this book, Prof Gombrich describes the Pāli language and its place in history. He discusses how texts were composed and preserved in the society in which the Buddha lived, where there was no writing. He uses strands of what we know about the language and that society to construct an argument which makes it appear possible, even probable, that Pāli is the language of the Buddha. More precisely, that the Buddha used Pāli when during a long lifetime he walked to and fro through the villages of northern India, preaching and interacting with the villagers. In other words, Prof Gombrich answers the question if the Buddha spoke Pāli with an emphatic “yes, Pāli or something extremely close to it”. How and why did the Buddha develop Pāli? The villagers with whom the Buddha interacted must have grown up using local dialects. These dialects must have been related, with no clear boundaries between them, since the institutions of administration and education which create such boundaries were lacking. The Buddha needed to understand the users of those dialects and in turn to be understood by them, and this need led him, perhaps unconsciously, to develop a composite dialect containing a great many variants. As he gathered disciples, some of whom moved with him, the language of his preaching became known as the “language for recitation”, which in Prof Gombrich’s view is what the word “Pāli” means; and it became the private (not secret) language of the religious community which he founded, the Sangha. Prof Gombrich’s claim that Pāli was the language used by the Buddha will surprise no traditional Buddhists, because they have always believed it. They have believed it, however, without any awareness of the difficulties it involves. To give just one example: it is surely remarkable that without writing, let alone any more modern technology for recording speech, all these texts could be accurately preserved for centuries. Western students of Sanskrit have now studied Sanskrit at the feet of traditional teachers and observed how not only their Indian pupils but also the western visitors can acquire mnemonic powers of which we did not know we were capable. Another relevant study is modern linguistics: fieldwork has shown that in other periods too, parts of India have evolved common languages. One can call each of them a lingua franca and they typically occupy a middle ground between local dialects and a formalized educated language used by an elite. If Pāli, or something very much like it, really was the language of the Buddha, this has great implications for the history of Buddhism. The early traditions which preserved their texts in languages other than Pāl began to evolve various new strands of belief and practice which became known as Mahāyāna. The Mahāyāna texts were in Sanskrit, or in what for simplicity’s sake we can call deviant forms of Sanskrit containing some of the features of Pāli. None of them were in Pāli itself: that was too firmly identified with the conservative Theravāda. Mahāyānists, however, have often claimed that their texts are authentic utterances of the Buddha, which he wanted kept as an esoteric secret teaching reserved for his more advanced disciples. This theory was never probable, and Prof Gombrich’s recent discovery makes it more improbable still. We have published a discussion of “Buddhism and Pali” on our YouTube channel. We hope you enjoy it! Oxford is the best heaven for intellectuals. Many thanks for starting online course for Pali language. This book is a great read for anyone interested in the relationship between Buddhism and Pali, or Buddhist history and Pali. Accessible to the dilettante as well as those studying the language, especially since it includes some intriguing new ideas. When will we be able to order this book online? I’m not finding it through U.S. websites or U.K. Thank you for your kind words and your interest in Prof Gombrich’s latest book. It is not yet out for sale – we are all awaiting the final steps from the publisher ourselves. Once it is out, we will update this article and also post on Facebook and Twitter. You may want to follow us there if you don’t do so already. Any chance we’ll see a Kindle version? Unfortunately, the publisher does not expect to offer a Kindle version prior to 2020. Will there be a kindle or ebook version?